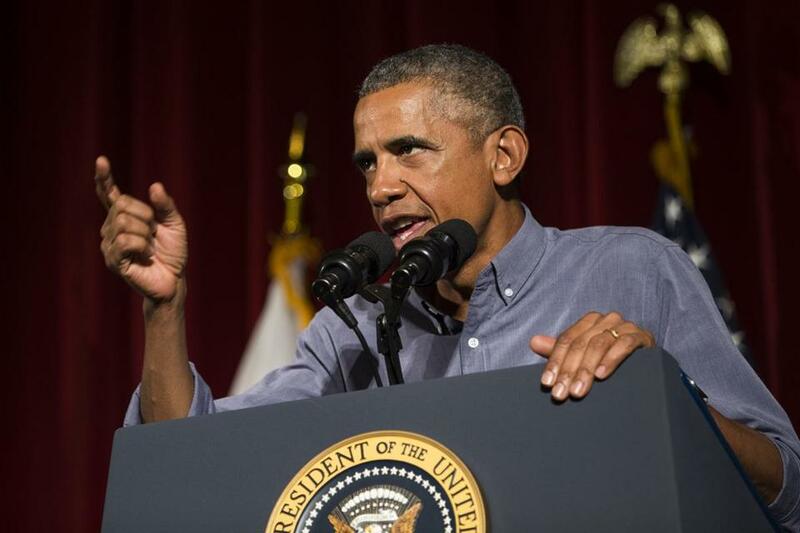 In a Labor Day visit to receptive territory in Boston, President Obama lauded Massachusetts for leading the way on worker-friendly measures, including the state’s new law requiring companies to offer employees earned sick time. Dressed casually in a button-down shirt and khakis, a relaxed Obama expressed relief that he is not on the ballot this election season, yet spoke forcefully about his record, contrasting his administration’s job gains and its efforts to help the middle class with opponents’ claims that requiring health care and raising the minimum wage will kill jobs. As expected, Obama used this Boston trip to announce that he had signed an executive order requiring federal contractors to offer employees up to seven paid sick days a year, depending on how many hours they work. The order will affect about 300,000 people, he told the crowd of about 765 union members gathered in Park Plaza for the Greater Boston Labor Council’s annual event. 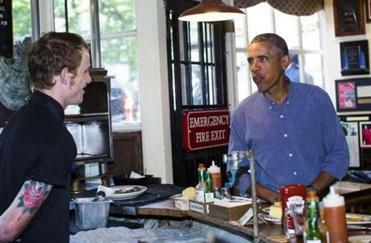 President Obama made a quick stop for lunch Monday at the country’s oldest restaurant, the Union Oyster House. Pointing to the difficulties in Congress, the president compared another government shutdown to “an unforced error, a fumble on the goal line,” and drew laughter when he referred to the infamous Bill Buckner flub of the Red Sox’s 1986 World Series. He also made two references to Patriots’ quarterback Tom Brady, whom a judge freed last week from a four-game suspension imposed by the National Football League for his alleged conspiracy to underinflate footballs during the championship game. Obama spoke fondly of Boston, recalling his years here as a Harvard Law School student, his breakthrough Democratic National Convention speech in 2004, and his visit two years ago for an interfaith memorial service following the Boston Marathon bombings. Sharing the stage with labor leaders and politicians, including US Senators Elizabeth Warren and Edward J. Markey, Mayor Martin J. Walsh, and Attorney General Maura Healey, Obama extolled the state’s leadership for safeguarding workers’ rights. Earlier in the day, Obama had been greeted warmly at Logan International Airport by both Walsh, a longtime labor leader; and Governor Charlie Baker, a Republican. President Obama spoke Monday during the Labor Day breakfast. The president also chided Republican candidates for president. One, he said, has been “bragging about how he destroyed collective bargaining rights in his state,” and saying that “busting unions prepares him to fight” the Islamic State, while another has “said a union deserves a punch in the face.” Though he didn’t name names, Obama seemed to be respectively referring to Governor Scott Walker’s crackdown on public unions in Wisconsin and New Jersey Governor Chris Christie’s combative words about national teachers’ unions. “It reminds me of something our old friend Ted Kennedy used to say: ‘What is it about working men and women that [they] find so offensive?’ ” Obama said. Before he left Boston, the president made an unscheduled stop at the Union Oyster House, the historic restaurant near Faneuil Hall, picking up chowder and shaking hands with patrons. On Air Force One, he was joined by Warren and Markey, as well as US Representatives Katherine Clark, Seth Moulton, and Ann McLane Kuster of New Hampshire. 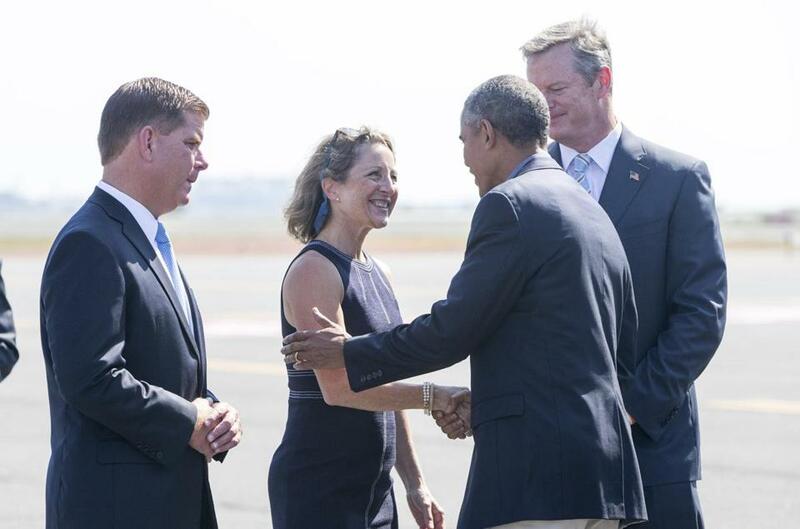 Arriving in Boston, the president was met by Mayor Martin J. Walsh (left), and Governor Charlie Baker (right) and his wife, Lauren. Peter Schworm of the Globe staff contributed to this report. Stephanie Ebbert can be reached at Stephanie.Ebbert@globe.com. Follow her on Twitter @StephanieEbbert.